On the misplay that cost him his perfect fielding streak, Curt Flood gave errors to teammate Lou Brock and the official scorer. Unfortunately for Flood, his opinions didn’t count. Instead, it was Flood who was deemed to have erred on a routine play that ended a record-setting stretch of perfection. 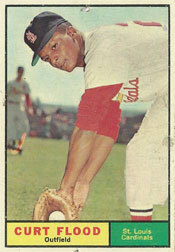 From September 1965 to June 1967, Flood, the Cardinals’ center fielder, flawlessly handled 555 chances and established a National League record for successive errorless games at 226. In 2013, another Cardinals center fielder, Jon Jay, broke Flood’s mark. Jay’s errorless streak reached 245 games before he made an error on July 30, 2013, against the Pirates in Pittsburgh. Fielding a single, Jay fumbled the ball, allowing the runner to advance to second. Before that, his last error was Aug. 24, 2011. Jay’s streak ended under less contentious circumstances than occurred with Flood. On June 4, 1967, Flood’s streak was intact when the Cubs faced the Cardinals at St. Louis. Brock, the left fielder, and Flood both called for the ball. As the ball descended, both outfielders again called out, informing the other he would make the catch, the Associated Press reported. Neither outfielder yielded. As Brock and Flood both reached for the ball, they bumped elbows and shoulders. The ball “bounced in and out of Brock’s glove” and fell to the ground, The Sporting News reported. Nye reached second base safely on the misplay, moved to third on Don Kessinger’s sacrifice bunt and scored on a Glenn Beckert fly out, giving Chicago a 3-2 lead. The official scorer, Neal Russo of the St. Louis Post-Dispatch, charged Flood with an error because “Brock easily would have caught the ball if Flood had not bumped him,” The Sporting News reported. Flood, described by the Associated Press as “upset and disappointed” at being charged with the error, said Brock should have backed away. Flood implied Russo should have given the error to Brock. Flood and Brock used their bats in helping the Cardinals rally from the deficit created by their misplay.